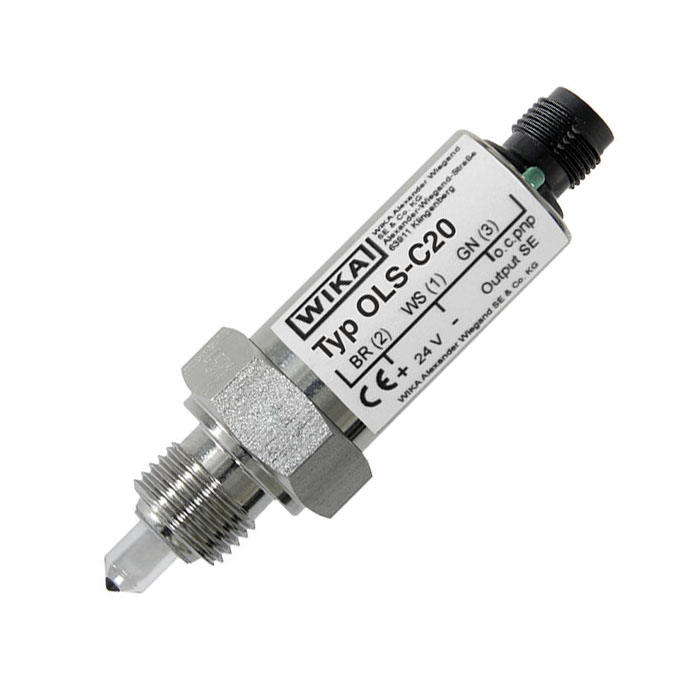 The model OLS-C20 optoelectronic level switches are used for the detection of limit levels in liquids. This is widely independent of physical characteristics such as refractive index, colour, density, dielectric constant and conductivity. Measurement is also done in small volumes. The switches consist of an infrared LED and a phototransistor. The light of the LED is directed into a prism. So long as the sensor tip of the prism is in the gas phase, the light is reflected within the prism to the receiver. When the liquid in the vessel rises and wets approximately 2/3 of the glass tip, the infrared lightbeam into the liquid is interrupted and only a small portion reaches the receiver. The O. C. pnp transistor output may be connected directly to the input of a control system or energise an external relay. The output is short-circuit proof and also current, voltage and power limited. The switching status can be read directly on the sensor (green LED).